What is the Best Tig Welding Cart Design? Have you ever heard the saying ..."Anything worth doing is worth doing right" ?? Watch this time-lapsed video of the fabrication of a cart for a Miller Dynasty 200dx and you will see something worth doing that was definitely done right... Over-the-top right with decals, spare tire and trick paint job. But with a purpose. In the same way that a portable welding rig that shines and is decked out with Aluminum diamond plate says something about the welder driving it, this TIG welding cart design says a lot about the welder that built it...Attention to detail, a flair for style, ability to design functionality..., are just some of the things that come to mind. The welder who built this cart was using his head, he didnt just whip something together that would get him by. He made something cool that he could be proud of and that will be an advertisement for his welding bizz, as well as a testament to his ability and his pride of workmanship for years to come. But you need some other stuff in order to do any tig welding. A cylinder of argon, and if you want to use a water cooled torch, you need a water cooler unit, a place to put stuff , a place to hang the torch, foot pedal, ground clamp etc.... Before you know it , you have this huge rig that is not so portable anymore. Make it so that you can unhook the machine and go portable if you need to . Have a 25 ft air cooled torch on hand along with 50 feet of argon hose so that you dont have to have the argon cylinder so close to the work. Make yourself some pigtail adapters so you can get power no matter what...remember the Dynasty as autolink. You can plug into 115v, 230 volt, or 460 volt . All you need is the right plug. And why not keep a few stick rods on hand too? Just chuck up a stick rod, set the machine for stick... and weld like hell. 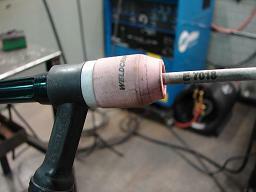 If you need to stick weld often, you should probably get a stinger, but it wont hurt to run a few rods with the tig torch...in a pinch.